Sorry, the 2012 tour of LILIES has now finished! This spring,we are again joining forces with Fresh Glory Productions to take LILIES ON THE LAND on a UK tour. We received 140 letters from former Land Girls in response to an article about the project in Saga Magazine. Many of these extraordinary letters contained photographs, which you can see here. View original WWII photos. 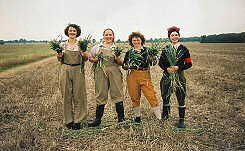 We also took plenty of photos while Lilies was being devised, both in our meetings with Land Girls, and in the studio. View photos of Lilies in development. The headshots above show Pauline Whelch, in her Land Army days, and at one of our meetings. 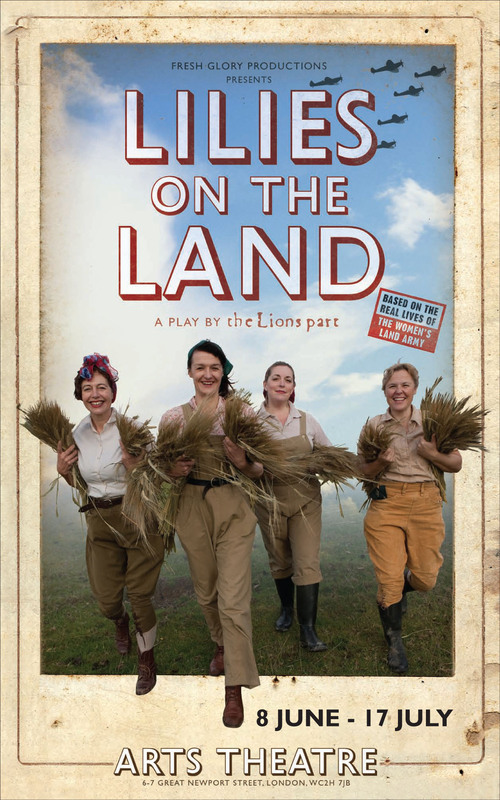 Lilies on the Land is a truly remarkable and sparkling piece of theatre which celebrates an extraordinary episode in Britain's history - the Women's Land Army of World War II. 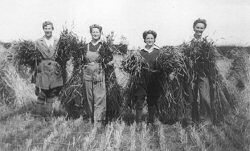 These gripping but charming tales, chart the personal journeys of four women who sign up to become Land Girls, determined to work endless, backbreaking hours on farms across the country in a bid to do their best for the war effort. Based on hundreds of letters from and interviews with the original Land Girls, Lilies on the Land is a revealing, funny, wonderfully moving and utterly captivating portrait of some of Britain's pluckiest, unsung heroes. Simply unmissable, this is theatre at its most memorable. Magnificent and very moving - a lovely mixture of poignancy and humour. Lilies on the Land is a unique theatrical tribute to the women of the 'Forgotten Army'. For two years the production toured to the heart of local communities where it was received with passion and enthusiasm by audiences of all ages. On tour it captured the hearts of audiences nationwide and played to 96% capacity audiences, was extended and managed to earn its keep without subsidy. Our grateful thanks to the following former Land Girls and their relatives: we have been overwhelmed by their generosity in sharing with us their memories, photos, songs, poems, and even their treasured uniforms! Dorothy Abbott, Stuart Antrobus, Audrey M Baker, D U Ball, Norah Barnsley, Sylvia Barton, Yvonne Bazeley, Phyllis Benham, Johanna Benn, Mary Bentley, Marguerite Bettles, Charles C Bogart, Betty Bowler, Emily Braidwood, Ruby Brass, Ruth Bridge, Sheila Brooks, Daphne M Byrne, Olive Cameron-Black, Marita Carr, Brenda Chapman, Joan Clifford, Wynne Conway, Violet Cowley, Cecilia Marie Cox, R W Cundale, Joan Davies, Kathleen Devereux Craven, Eve Diet, F I Eakins, Marion Eyre, Brenda Flint, Vera-Jaye Footer, R Franklin, Lynette French, Mrs Gillman, Pauline M Godfrey, Ivy Goodall, J V Greenhowe, Winifred Griffiths, Marjorie Hall, Kathleen Harriss, Marjorie Harvey, D F Hawkes, Joan Heatley, Doreen Holliday, Mary Holmes, M G Holmes, Nesta Hoyle, Doris Jerrison, N Johnson, Frank Jolliffe, Shirley Joyner, K S Kenrick, M E Kilner, Olga King, Mary Knight, Pam Lampard, Evelyn Lavin, Lily Limbert, Elizabeth Lowe, Kate Lowe, Norah M Walls, Betty Marsh, Eileen Mayson, Pamela McDowell, Kathleen McKinnon, Mary McLelland, Ann Mehose, Kathleen Meredith, Margaret Middleton, Joan Molesworth, Nora Mollon, Jane Neave, Dorothy Nelson, Peg Newman Francis, Joan Norman, Gwen Norman, Ennis Nosko-Smith, Dorothy O'Connell, Nona Pallett, Brenda Parfitt, Jean Patterson, M Paulley, Yvonne Pearce, D M Peskett, Clare Pierson, Thora E Pitman, Dorothy W Platts, Margie Prest, Jean Prior, Gwen Rae, Doris 'Billie' Reeg, Sylvia Richards, Pamela Ruffoni, Phyllis Sharp, Mary Smith, Edna Smy, Betty Spridgeon, J Steel, Mary Stokes, Barbara Stone, June Stonebridge, Jeanette Street, M Swaffer, Ruth M Swift, Terri Taylor, Jane Thomas, Joyce M Tilley, Norah Turner, Jean Wagner, Grace Wallace, Margaret Watford, Kathleen Watson, Joyce Watson, Ruth Weaver, Jackie Webb, Daphne Webster, Margaret Wegg, Margaret West, N E Wheeler, Pauline Whelch, Peggy White, B I Wilkinson, Edna Williams, Audrey Witney, P A Woolley, and those who wrote to us without giving their name.